Over thirty years ago Dr Kilmer McCully, a pathologist at Harvard Medical School, identified the link between high homocysteine levels and cardiovascular disease. His study was focused on a group of children with extremely high levels of homocysteine caused by inborn errors of metabolism. He noticed that these children had suffered conditions which are normally associated with adults – blood clots and strokes. In search for explanation Dr McCully found that there was a link between high homocysteine levels in the body and cardiovascular diseases. He also discovered a simple solution to this problem – Vitamin B12, which proved to be effective in reduction of the number of heart attacks and strokes in people with high homocysteine levels. Unfortunately, Dr McCully’s finding was ignored at the time when a controversial hypothesis of cholesterol involvement became a big news. Thirty years later, the medical profession once again take notices of Dr McCully’s research. Homocysteine is an amino acid that does not exist in the natural human diet. It is produced in the body as a result of methylation reactions. While homocysteine is a part of methionine metabolism, higher levels of homocysteine have been associated with many pathological conditions including vascular, neurological, ocular, renal, pulmonary and skeletal muscle abnormalities. The body tries to recycle the homocysteine back into methionine. The main enzymes involved in the metabolism of homocysteine in the body require the presence of cofactors, such as vitamin B 6, vitamin B 9 (also known as folic acid) and vitamin B 12. However, those people who are deficient in either of these vitamins have a poor recycling process therefore levels of homocysteine gradually build up. The simultaneous detection of vitamins B 6 , B 9 , B 12 leave homocysteine unmetabolised that puts at risk your cardio health. High levels of homocysteine cause blood vessels to lose their elasticity that makes it harder for the blood vessels to dilate. This in turn results in damage to blood vessel linings that allows LDL cholesterol and other substances to stick to the inner lining, leading to atherosclerosis. This gives rise to a risk for stroke, heart attack and blood clots. The cheap and easy way to lower homocysteine levels is a therapy based on daily intakes of Vitamin B12, Vitamin B6 and Folic Acid. Many doctors are aware of the Folic Acid link, but not many know the importance of Vitamin B12, which is essential to Folic Acid assimilation. Studies show that using Folic Acid alone can reduce homocysteine for some people but it does not work very well for others. 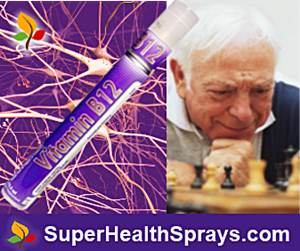 Adding B12 and B6 is the solution because all three vitamins work in synergy. For homocysteine, the level in healthy subjects is less than 2700 ng/ mL and the upper limit of 2027 – 3379 ng/mL is considered to be hyperhomocysteinemia. So if your homocysteine levels are high you should ensure that your doctor tests your Vitamin B12, B6 and Folic Acid levels. The Methylmalonic Acid (MMA) test is the most accurate for testing B12 levels. 1.Vyssoulis G, Karpanou E, Kyvelou SM, Adamopoulos D, Gialernios T, Gymnopoulou E, et al. Associations between plasma homocysteine levels, aortic stiffness and wave reflection in patients with arterial hypertension, isolated office hypertension and normotensive controls. J Hum Hypertens 2010;24:183-9. 2. Nilforooshan R, Broadbent D, Weaving G, Gurton J, Moore V, Houston L, et al. Homocysteine in Alzheimer’s disease: Role of dietary folate, vitamin B6 and B12. Int J Geriatr Psychiatry 2011;26:876-7. 3. Xu F, Zhang L, Li M. Plasma homocysteine, serum folic acid, serum vitamin B12, serum vitamin B6, MTHFR and risk of pseudoexfoliation glaucoma: A meta-analysis. Graefes Arch Clin Exp Ophthalmol 2012;250:1067-74. 4. Ferechide D, Radulescu D. Hyperhomocysteinemia in renal diseases. J Med Life 2009;2:53-9. 5. Fimognari FL, Loffredo L, Di Simone S, Sampietro F, Pastorelli R, Monaldo M, et al. Hyperhomocysteinaemia and poor vitamin B status in chronic obstructive pulmonary disease. Nutr Metab Cardiovasc Dis 2009;19:654-9. 6.Jacobsen DW. Homocysteine and vitamins in cardiovascular disease. Clin Chem 1998;44:1833-43. Healthy subjects are reported to have plasma levels of vitamin B 6 , vitamin B 9, and vitamin B 12 at 7.4 ng/mL,  2.7 – 17.0 ng/mL  and 200 – 900 pg/mL,  respectively. The groups most at risk of Vitamin B12 deficiency are the elderly, vegans and vegetarians, those who have had gastric surgery and those who abuse drugs and alcohol. Some prescription and over the counter drugs can also lead to B12 deficiency. Vitamin B12 is a water soluble B vitamin naturally found in fish, dairy produce, organ meats, beef, pork, nuts and seeds. Folic Acid (Vit B9) is needed for the utilisation of sugar and amino acids. It is essential for the division of body cells and during pregnancy it can prevent spina bifida. Folic Acid also helps prevention of some types of tumours and heart disease. 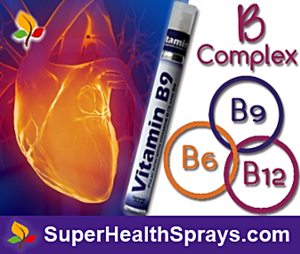 Vitamin B9 works with vitamins B6 and B12 and other nutrients to control blood levels of the amino acid homocysteine.